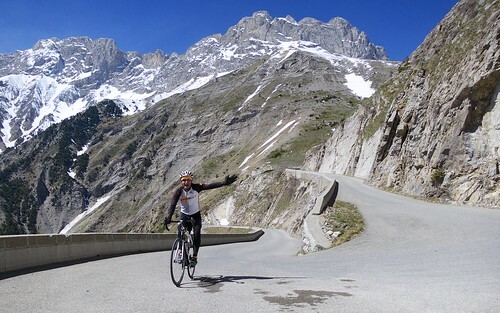 Here are ten great routes from 2013 along with some photos that I quite liked. Happy New Year. Yes, my 2013 cycling season was cut short due to knee troubles, but I still enjoyed some great rides. Here are ten great routes along with photos that I quite liked. An amazing high altitude ride up to the Dam / Lake de la Sassière and then much higher on the remnants of an old military trail to Col de la Bailletta (2853 metres). 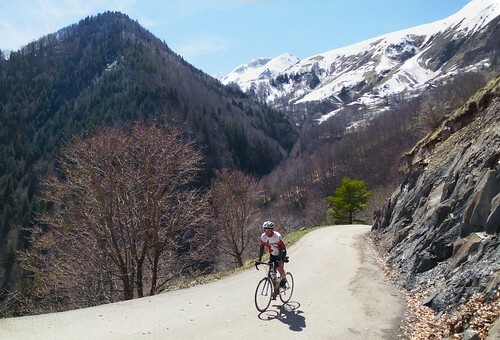 This almost unknown climb starts near Val d’Isère. Detailed blog post (map, photos, etc) here. 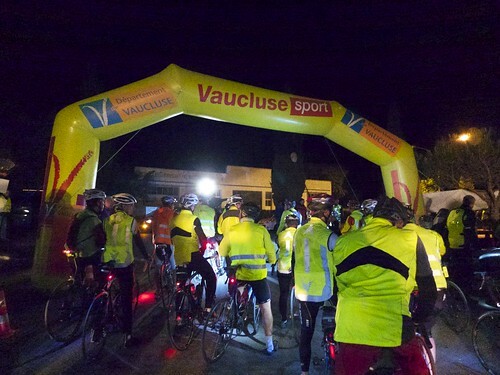 For the second time I participated in the night time ascent of Mont Ventoux with the boys from St- Etienne. The goal is to see the sun rise at the summit. Event organizers closed the road aboved Chalet Reynard due to high winds storm threats …. but we snuck up anyway. Much Fun. This challenging climb in central Switzerland next to the Eiger is one of the most beautiful routes I know. Scouting a 2013 Dauphiné route I was thrilled to find such an interesting route with crazy hairpins. Col du Noyer is a beautiful, medium difficulty climb in the Hautes Alpes starting beside the Route Napoléon (there is a refuge Napoléon at the summit). 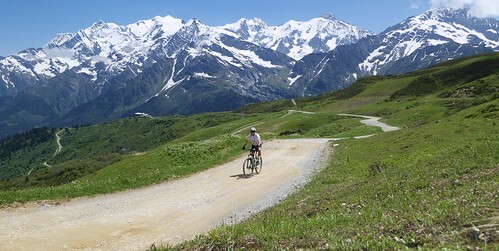 Climbing both sides of Galibier on a sunny day in June is always a dream. Below a video instead of a photo. Fantastically named high passes in central Switzerland. I was surprised to find Hahnenmoos fully paved on the east side. But I was prepared for unpaved and next went higher off-road to find Bummerepass and returned via the unpaved west side of Hahnenmoos. Amazing place. 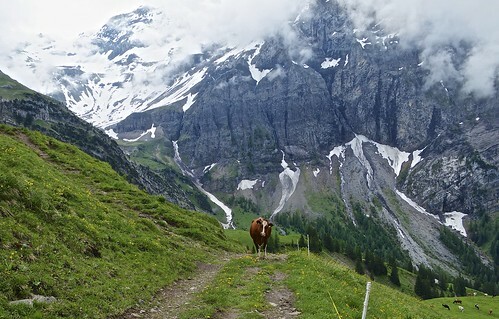 The Vallée Verte is the scenic medium mountain region due south of Lac Léman (Lake Geneva). I had done a couple of 5 col loops previously, but decided to link up ten in one ride. Woohoo. One always suffers climbing Alpe d’Huez as the history motivates and the steepness hurts. But the real gem of this ride was the amazing little road up to the village of Oulles. A hidden gem that starts near Bourg d’Oisans. 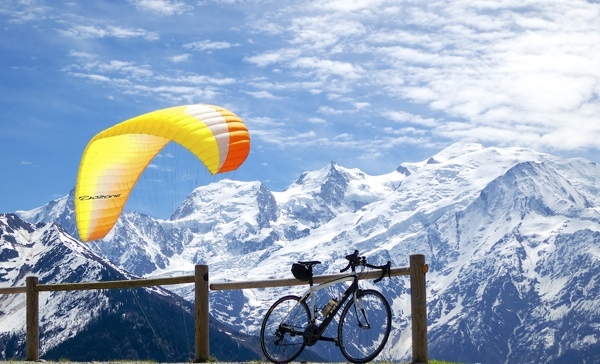 Col du Joly is one of the best high roads to get close up views of Mont Blanc. The Beaufort side is paved and much fun, but I decided this time to climb the east side on ski service roads. Steep, deserted and beautiful. 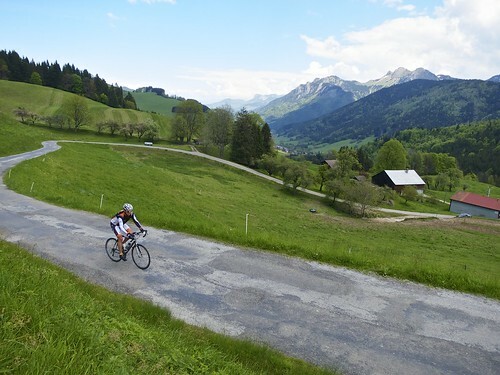 My last ride before injury was the higest paved mountain pass in Europe ….. with my lovely and brave wife ….. on a day the road was closed to cars. Not bad! Here’s hoping we all have some great rides in 2014. Plaine Joux is a cross-country ski center high above Sallanches. It’s also a very popular “take-off” spot for parapenters (see photo). Route next finally makes a quick visit to the site and monument of Bernard Hinault’s 1980 World Championship win: Domancy. Good morning Will & Happy New (cycling) Year ! Merci Will pour ces magnifiques images qui font rêver à ce moment de la saison ! Surtout celle du Galibier que j’ai “raté” cette année (impardonnable). Bien évidemment je vous souhaite une excellente année 2014 et je me réjouis d’avance de toutes les ascensions que nous partagerons ! Hope the winter training is going well. 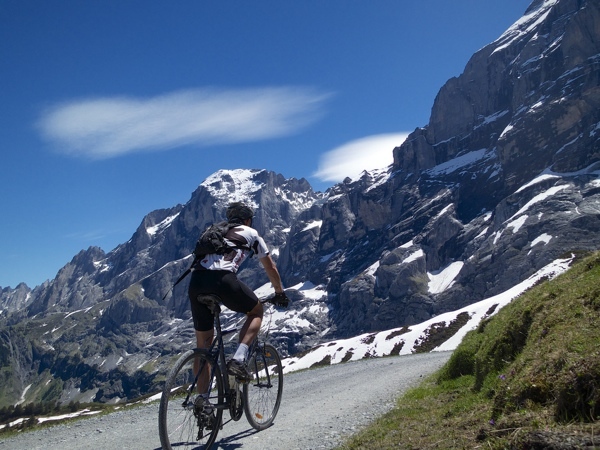 Looking forward to reading more of your exploits in 2014 and maybe see you in the Aravis one day?! A quick techy question for you, if you don’t mind… how do you embed your bikemap routes into your blog? I have been trying to do this on wordpress.com but it doesn’t seem to like the code that bikemap generates… any clues would be very much appreciated! The embed should work. But some WordPress setups I think have fancy post writing setting that Over-ride the basic embed HTML. You want to ensure your text editor accepts html. Make sense? Happy to have a look if you drop me an email offline.